Before you decide what coating you need to enhance the surface of any metal, you should first think about your operating environment and the impact the coating in question could have, what it could be and what it definitely should not be. In this industry, surface coating usage has grown hugely over the last fifty years. It was then that the internal combustion engine was usually manufactured out of cast iron, forged steel and die-cast aluminium alloys. Heat treatment was combined with white metal or bronze bearings in order to provide wear surfaces. These were lubricated by the oil films pumped through large expanses created between moving surfaces. Though they operate in the same way, cars and their engines today must last greater distances, adhere to emissions regulation and aim for reduced consumption of fuel in order for lighter engines, lower engine tolerance and lower friction between moving parts. This has meant that a wider array of coatings has become necessary to overcome certain common problems, such as wear, corrosion and friction and aid the long-life performance that our modern cars need. Piston crowns are often coated with thermal insulated ceramic coatings, usually in diesel engines. Mating cylinder linings can be coated with electrolytic or electroless plated composite finishes Silicon carbide, diamond or boron nitride. Fuel storage and delivery systems need electroless nickel plating (especially in bio fuel consuming cars), frequently enhanced by powder coatings or e-coat top coats. Brakes require hard anodising, enhanced by applying paint or powder coating top coats. Brake systems, fluid delivery pipework and air suspension systems use ductile zinc nickel plating. Motors contain neodymium, iron, boron magnets which need TriCem coating and heat treatment, to enhance magnetic performance but to leave the alloys unaffected. us, Derbyshire, are leading specialists in the plating industry, specialising in electroless nickel plating. We have developed a wide range of techniques and are able to provide high-end, cost-effective services for you. We have great experience working with many companies in the automotive industry, as well as the aerospace and military industries, too. We service the whole of the UK, France, Holland, Brazil and Germany, offering many services, such as nickel diamond plating, diffused nickel plating, copper plating, shot blasting and heat treatment. If you or your business are interested in finding out more about any of our specialist treatments then please give our friendly and professional team a call today on our phone number, you can send us an email at info@metal-finishing-company.co.uk or alternatively you can visit our website by clicking here. As experts in metal finishing and metal plating, us have recently expanded our services to include aqua blasting, or vapour blasting, as it is sometimes called. This wet blasting process has many great advantages, including the ability to effectively and gently eradicate surface dirt and grime from metal components. Here are 3 reasons to choose aqua blasting as your metal cleaning method of choice. The process permits non-aggressive surface cleaning in order to produce a satin finish on a wide range of metals. Aqua blasting cleans by the flow of water and not impact, and the water acts a lubricant between the media and the component. It involves the use of a non-ferrous media; which is subsequently mixed with water to result in an extra-smooth finish once the process has been carried out. That is possible thanks to the flow of a water-borne abrasive. Unlike shot blasting, and other blasting methods which actually move the surface material from the components, the process of aqua blasting is non-intrusive. It is, therefore, suitable for delicate parts and soft metal. Aqua Blasting is commonly used when a fine finish is required for aluminium, alloys, steel and many other metals; including bronze, magnesium, titanium, brass and copper. Another benefit to aqua blasting is that the water used in the process acts like a protective buffer. This means that the emulsion is able to effectively lift off any grime, all the while leaving the underlying surface intact. That means that there will be no alteration to the dimensions of the treated part, eradicating the need for post treatment plating etc. In addition to its gentle cleaning properties, aqua blasting is a process that can also be used for the removal of carbon deposits, and the removal of paint, rust, carbon, and similar deposits in engineering industries. It can also be used as a method of surface preparation prior to bonding, re-painting or re-coating. To find out more about our aqua blasting service, as well as a range of our other metal plating and metal finishing services, call us on our phone number or email info@metal-finishing-company.co.uk. us have been lucky enough to be involved in the nickel plating of a number of extruded benches for English designer Thomas Heatherwick. Known for his innovative designs and creative use of engineering and materials to produce public monuments and sculptures, Heatherwick works across the disciplines of architecture, art and design. These amazing extruded benches began life in Heatherwick’s design and architecture studio when working on a project that involved manufacturing aluminium components through an industrial process called extrusion. The process of extrusion involves squeezing heated metal through a shaped hole which is known as die. The heated metal produces straight aluminium lengths with a precisely shaped cross section. Extrusion often produces contorted shapes when the metal initially squeezes through the die because the metal is inclined to snag warp as it struggles to fit through the gap. The form eventually straightens out and usually during this process; the contorted end is chopped off and melted back down. But Heatherwick considered the mutated sections to be more interesting than the straight parts, and decided to produce more warped lengths of extruded aluminium on a much larger scale! The designer then wondered if it would be possible to use the extrusion process to create seating, much of which was needed at the time to furnish new airports and stations being built around the world. Heatherwick saw it as a simple but effective alternative to ordinary furniture that needed to be made up of several components and materials. These extruded seats could be made all in one go, with the legs and back of the seat formed all at once. So, the Heatherwick studio hunted for a machine capable of making this dream a reality for more than 16 years, until they finally came across a new extrusion machine that had been built in the Far East. The machine was designed for use in the aerospace industry and had the capability of exerting ten thousand tonnes of pressure. The factory it came from could not actually guarantee the outcome of the experiment because the machine had never been used to its full capacity. Using this specialised die, Heatherwick and his studio staff made a series of aluminium benches with straight, extruded lengths, and contrasting raw, contorted ends. We were asked to carry out the electroless nickel plating of the benches in order to provide a high quality surface that would be very resistant to wear. For more information about our recent case studies and details of other great projects that we’ve been lucky enough to be a part of, check out the metal plating case studies page on the us website. As experts in metal finishes and plating techniques used in the aerospace industry, we were delighted to read the news about the new £110 million advanced blade casting facility which has been opened nearby in Rotherham. Rolls-Royce have opened the 50,000ft² facility, which is expected to produce more than 100,000 single crystal turbine blades a year, including high pressure (HP) and intermediate pressure (IP) single crystal blades. The facility will make use of the manufacturing methods that have already been developed within Rolls-Royce and at the Coventry based Manufacturing Centre. The facility will include automated manufacturing techniques, including integrated wax fabrication lines, 3D structured light inspection and computed tomography (CT). The new plant will produce turbine blades which will be used in various Trent aero engines, Rolls-Royce Trent XWB, which will power Airbus A350 XWB. Each Trent XWB engine requires 182 HP and IP turbine blades, which are 10cm in height and 300g in weight, and undergo 200 processes before being installed. The blades operate at temperatures of up to 200°, and are placed in a disc that rotates at over 12,000rpm. The turbine extracts energy from the engine’s combustor hot gas stream, and uses it to drive the fan and compressors. Electroless nickel plating is a cost effective and high quality solution to protecting metals from corrosion and increasing their life span. Nickel coatings have a variety of fantastic properties from wear resistance to hardness, making it a popular choice of metal plating for the defence, automotive, aerospace and healthcare industries. However, electroless nickel plating is quite a complicated process that involves precision and careful execution. As experts in the process, we’ve put together a few top tips that will ensure that the best results are achieved during the process of nickel plating. For the electroless nickel plating process to be effective, the chemicals in the plating bath need to be of a precise balance. This requires continuous monitoring of the plating solution to ensure that the chemicals a replenished sufficiently. In order to remove insoluble materials that can cause substrate roughness, the plating bath needs to be filtered continuously. Components should be chemically pre-treated and rinsed thoroughly before the plating process to ensure that any surface contaminants are removed. There are other mechanical finishing techniques that can also be used to prepare the surface of the part for electroless nickel plating and improve the condition of the service, for example shot blasting. The temperature of the nickel plating bath needs to be monitored closely throughout the plating process. If the temperature is too low, it will have the effect of lengthening the plating process and in extreme cases may prevent the metal coating from depositing properly. If the temperature is too high on the other hand, the speed of the deposition will be speeded up beyond a level that is optimum for quality, and may result in the substrate blistering. Any impurities in the water used for the EN bath can result in unacceptable plating results. The water should be free of metal ions, particulates or other foreign matter. Contact us today on our phone number or email us at info@metal-finishing-company.co.uk to talk through your electroless nickel plating requirements and see how us can provide high quality processes at a cost to suit your business. We’re very pleased to have been featured in the Derbyshire Times this week! The paper published an article about our recent factory expansion and our funding deal from Yorkshire bank that made it possible. Our Commercial Director Marcus Hill told the Derbyshire Times: “We’re pleased to be expanding to meet the growing demand for our expertise and products. The electroless nickel plating facility here at us is one of the largest in the world, and we are really pleased to be able to expand our production capacity. As readers of our blog and our customers will know, we provide a variety of services including pipe strengthening and exterior protection to a variety of different industries including oil, aerospace, architecture and art. As experts in the field of electroless nickel plating, corrosion resistance and surface technology; we are delighted to be able to add Aqua Blasting to our repertoire of fantastic services. Also known as vapour blasting; this wet-blasting process is perfect for the gently eradicating surface dirt and grime from metal components. Aqua Blasting permits the non-aggressive cleaning of a surface to produce a satin finish on a number of metal materials – which resultantly won’t pick up marks after treatment.This new process that we are now offering involves the use of a non-ferrous media; which is subsequently mixed with water to result in an extra-smooth finish once the process has been carried out. That is possible thanks to the flow of a water-borne abrasive. Aqua Blasting cleans by the flow of water and not by impact; with the water acting as a lubricant between media and component. With the water acting as a protective buffer; and the emulsion gently eradicating any grime – the underlying surface is crucially left intact. Vitally, there will be no alteration of critical dimensions. The creation of any dust is also avoided; as there no break-up of any media during the Aqua Blasting process. Unlike with shot blasting (and other blasting methods which actually move the surface material from the components), the process is non-intrusive; and it is perfect for delicate parts and soft metal. Aqua Blasting is commonly used when a fine finish is required for aluminium, alloys, steel and many other metals; including bronze, magnesium, titanium, brass and copper. It also used in the removal of carbon deposits, paint and rust in engineering industries; as well as in surface preparation prior to bonding, re-painting and re-coating. Examples of industries where the process is commonly utilised include automotive, aerospace, reconditioning and maintenance. The process is particularly ideal for the degreasing and surface finishing of a number of bike and car components; including cylinder heads, motorcycle wheel hubs and side covers. Aqua Blasting can also help to reduce porosity in castings and is very easy to keep clean. It can be applied to almost all metals; and degreases and cleans the surface of them in tandem. To find out more about our new treatment process – as well as a range of our other metal plating and metal finishing surfaces – you can call us on our phone number or email info@metal-finishing-company.co.uk. As experts in the various processes of metal finishing, and often the company of choice for several aerospace companies, us recently took on a project pickling steel for world renowned Aerospace group Meggitt. Meggitt PLC is a global engineering group specialising in extreme environment components and sub-systems for aerospace, defence and energy markets.They are a FTSE 100 supplier of aircraft parts, and they supply flight displays and wheels to both Boeing and Airbus. The process of pickling stainless steel is a metal surface treatment that is used to remove any impurities from the surface of the metal. This could be stains, inorganic contaminants, and rust or scale. Acid is commonly used to remove these surface impurities. Staff at us used hydrofluoric and nitric acid to remove the discoloured scale from the stainless steel, and as you can see from the pictures, the process makes a huge difference to the surface of the steel. Hydrofluoric acid is a really effective acid for pickling; although it is typically more expensive than other acids, the process of pickling is much quicker and it effectively minimises the base metal loss. We had the exciting task of pickling stainless steel for a project located in offshore Brazil and were lucky enough to be chosen as partners in the project because of our expertise in the safe handling of hydofluoric acid, which is an integral part in the process we carried out for Meggitt. If you would like more information about us’s capabilities with regard to metal pickling, pickling stainless steel, and our experience working with substances such as hydofluoric acid, please don’t hesitate to call us on our phone number or email us at info@metal-finishing-company.co.uk. Here at us, our experience in the metal finishing and surface technology fields allow us to work with a variety of customers from a wide range of industries. One of the specialist services we offer is nickel PTFE plating, a unique plating solution that combines the hardness of electroless nickel with the lubricity of Polytetrafloureothylene, otherwise known as PTFE. The PTFE coating is perfect for those customers that require a lubricious, hard, uniform coating that can be accurately deposited across the surface of the component. Our electroless nickel/PTFE composite is a fantastic coating that properties of PTFE with those of electroless nickel. PTFE is self lubricating, has excellent low friction and release properties. Combined with the wear resistance, corrosion resistance and hardness of electroless nickel, Ni-PTFE is the perfect surface treatment. Its self lubricating properties also make it ideal for components that are unsuitable for conventional lubricants. What are the Key Properties of Nickel PTFE? Where Can Nickel PTFE Coatings be used? We are pleased to announce that we have been shortlisted for The Wake Smith Excellence in Manufacturing Award at the 2013 Sheffield Business Awards. A modern, efficient and innovative approach to manufacturing. Exhibits best practice to build a sustainable operation either by the development of new manufacturing techniques, new products or capital investments. A track record for training and passing on skills to future generations and the desire to promote the region as a center for manufacturing excellence. us have over 30 years specialising in the process of electroless nickel plating. Over the years we have developed a range of metal finishing and metal plating processes and techniques. In addition to electroless nickel plating, we also offer the services of diffused nickel plating, copper plating, shot blasting and heat treatment. Electroless nickel plating can be a great alternative to stainless steel. It’s much more cost effective and it still offers amazing corrosion resistance. Stainless steel is very expensive and it’s often hard to find a source to cast very large components made of stainless steel. Making large parts out of cast iron and then electroless nickel plating them is a cheaper and quicker solution. It’s also perfect for plating large machined parts that need to be resistant to corrosion. Electroless nickel plating is also a great alternative to stainless steel because of its hardness and wear resistance. Here at us, we’re experts in the process of electroless nickel plating and our equipment means that we can plate even the most difficult large parts accurately and consistently. 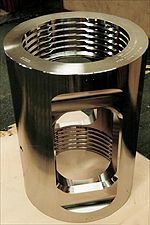 As electroless nickel plating specialists, us have been approached for various plating techniques for a variety of projects. One of our more unusual projects involved nickel plating a very out of the ordinary table for Meta, the contemporary objects and furniture company created by Mallet Antiques. Designed by Asymptote Architecture, this amazing coffee table has been hand cut from a 5.2 tonne billet of gunmetal-quality steel, and nickel plated by us! Named ‘Ivo 03’, this unique piece of furniture has been exhibited in Milan, New York City, London and Miami. This type of steel is perfect for this piece, as it can be carved with the finest detail and then polished. The table consists of 2,000 mathematically delineated diamond shaped pieces, each of a slightly different shape. The slumped glass top has been suspended across the surface of the steel, which is highly polished to give the look of shiny waves of steel. The base of this beautiful table is made from bespoke Tula steel. Tula steel is an historic metal that Meta has carefully recreated by analysing an original and rare piece of Imperial Tula steel dating back to 1780. The edges of the table’s metal base have been hand etched with an intricate and sympathetic pattern of incised relief, by the same craftsmen who restored parts of the Kremlin Palace. In addition to nickel plating, the table was also hand finished using traditional polishing methods to bring out the smooth, reflective qualities if the metal. Over the years the staff at us have developed a wide range of metal finishing and metal plating techniques. We are able to process many materials such as ferrous substrates, plate stainless steel, plate copper and its alloys, and even plate aluminium alloys. There are endless applications for electroless nickel, and they can be found in a huge number of industries. The effects of salt spray on metal coatings can result in corrosion of the surface of the metal. Metal surfaces that are exposed to marine environments need to be fit for use in sub-sea conditions to prevent this type of corrosion from occurring. Here at us, we aim to keep at the forefront of our industry by developing products to solve problems such as these. We needed to come up with a product that would be a cost effective answer to extend the life of mild steel exposed to a marine environment. Components operating in conditions such as these need to last a long time, as the simple act of just replacing them can result in downtime and can be very expensive. Through years of research, development and testing, we’ve created a product that protects mild steel from salt spray corrosion for an unprecedented amount of hours – SeaTEC 100. It’s a really exciting achievement within the engineering industry, and is ideal for use in sub-sea conditions. SeaTEC 100 can be used to plate metal components, valves and connectors used in marine environments. It is able to increase the strength of items such as pipeline connectors, which is ideal because these are the points at which the material is at its weakest level. It has also been tested to withstand salt spray conditions for over 25,000 hours, an unprecedented amount of time within this industry. It is also available in a variety of colours. SeaTEC100 is an ideal plating for oil rigs and pipes used to transport oil and gas as it can substantially extend the life of materials such as mild steel. This means that downtime as a result of corroded parts is severely reduced or avoided altogether, and the cost of repairing, replacing or maintaining parts is reduced too.